One of the most essential parts of a Node.js application lifecycle management is test automation. You must watch out for code breaks. Especially when the app goes big and complex and when all you ever want to do is coding or focusing on solving problems, you really don’t want to test code manually. This is a waste of time and productivity. But, we are programmers and we want our test code to test our code. In this post, I have shown how you can perform server-side functional tests least but not limited to testing DOM values, etc., without launching a browser, however, though it will not be able to test client-side functionalities. 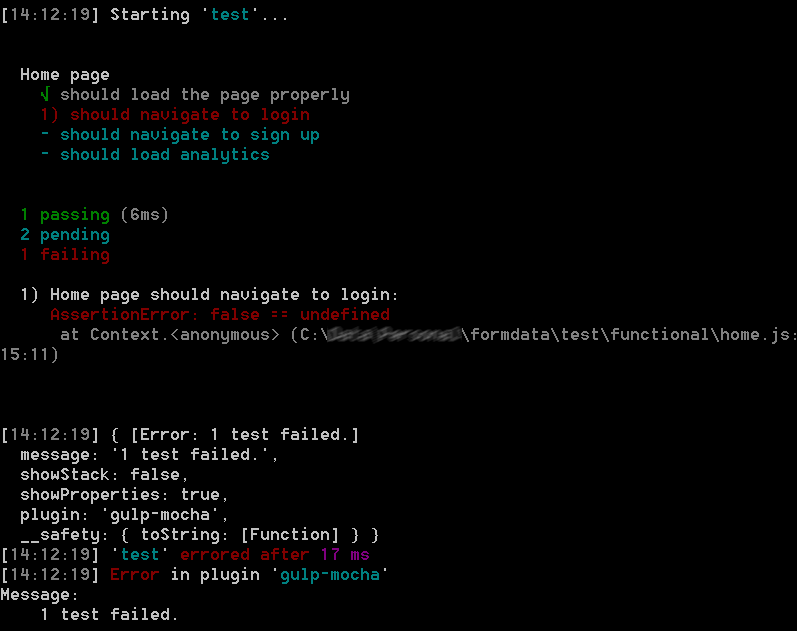 I have covered a bit of Gulp, Mocha, Request and Cheerio in order to perform functional tests on a Node.js app. It’s important to note that we’re not going to test code, rather test the functionality of our app, and at the same time, similar results if not better can be achieved by record/write & replay using Selenium as well, and there’re more eg. PhantomJs/Zombie.js, but that I might cover in future posts. 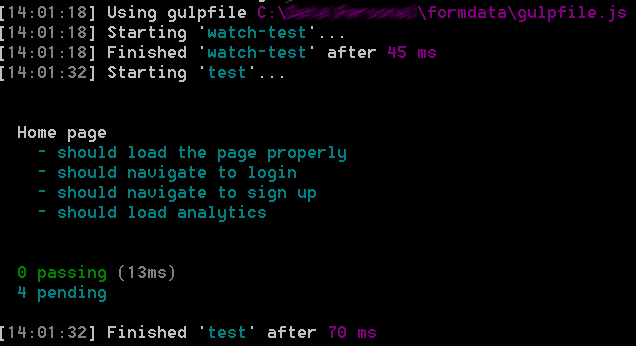 Gulp is a build system, which will assist in running the test code as part of the build. It can watch for file changes and trigger test automatically. Popular equivalent of Gulp is is Grunt. There’re various reasons why I prefer Gulp over Grunt, which is outside the scope of this post. Mocha is a test framework, which gives the instruments we need to test our code. Popular alternative to Mocha is Jasmine. Request is one of the most popular module that can handle HTTP request/response. Cheerio is a cool module that can give you a DOM from HTML as string. Chai is a fine assert module. 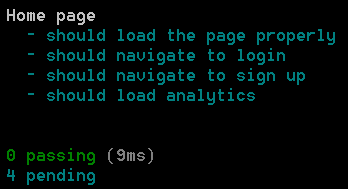 Consider a simple Express + Node.js app that we’re putting under test, which has a few buttons and clicking on them will navigate to relevant pages. If no such page is found, a Not Found page will be displayed. We’ll test whether the page loads properly with the expected text in the body, and clicking on Signup and Login redirect user to respective pages. Now if you execute mocha you will find the same results as previous. If you have noticed I have specified a reporter here called ‘spec’ – you can also try with nyan, progress, dot, list and what not in order to change the way Mocha reports test results. I like spec, because it gives me Behavior Driven Development (BDD) flavor. As you can see all of our tests are still pending, lets go ahead and write some tests on our setup now. We need to refer back to the test/functional/home.js file. Let us implement two simple tests, first one to succeed, and the latter to fail. I’m using Node’s assert module here to report satisfied/unsatisfied conditions. If you ever get to work with PhantomJs/Zombie.js/Selenium, you will see in how many places you need to change code in order to get your test code up and running. I have built this test infrastructure in order to remove all such pain and streamline the process. The only place I have to change is the test/functional/home.js file, and the rest will play along nicely. The code here is quite self-explanatory. I have used Request module to GET different paths of my website. I have checked for HTTP response code and if there was any error. I have used jQuery-like DOM manipulation to retrieve resulting HTML, and also used another nice module called string in order to check the string values. Cheerio was used to very conveniently load a DOM from the resulting HTML that was returned in response. And, they were all reported via chai library using “expect” flavor. 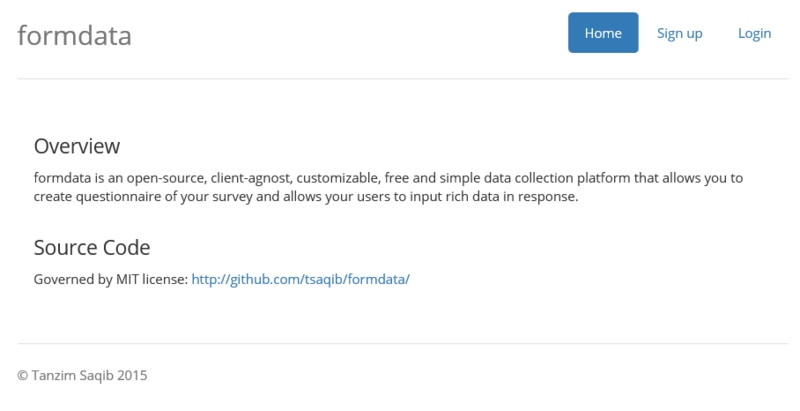 I will try to continue building this project and here’s the github address: https://github.com/tsaqib/formdata and live demo is here: http://formdata.azurewebsites.net. This entry was posted in Open Source Tech. and tagged chai, cheerio, continuous testing, gulp, mocha, Node.js, qa, request, test automation on June 6, 2015 by Tanzim Saqib.